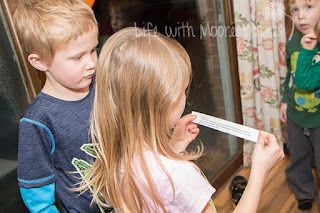 A few years back we came up with the best way to count down to New Year's with little kids (if you want them staying up that late in the first place)! The next year, we used our balloon countdown to learn a bit about geography! Then the next year, we had a baby. 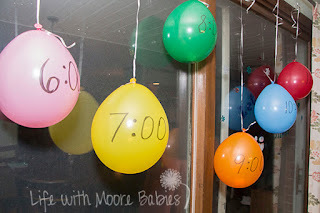 Yep, I left the hospital New Year's Eve day and did not have the energy to put together a countdown for my kids. 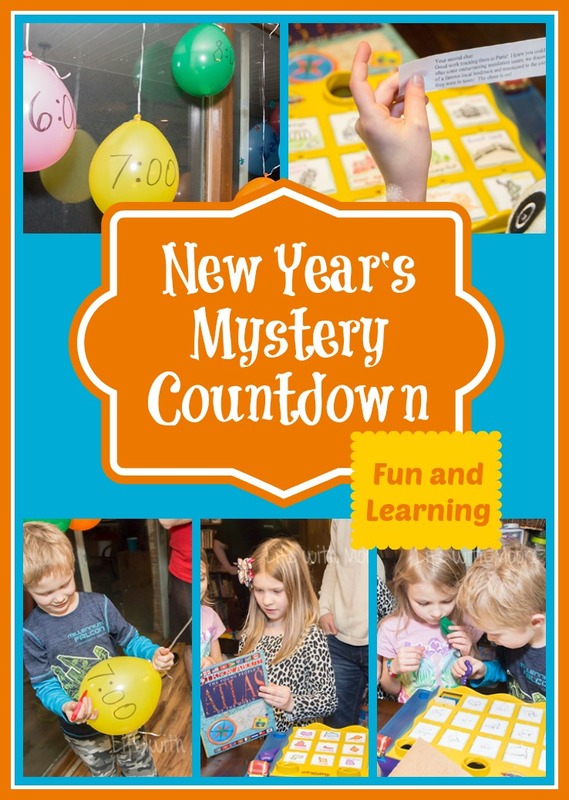 So, last year, I made it up to them with a New Year's Mystery Countdown! Really that is all you have to have. 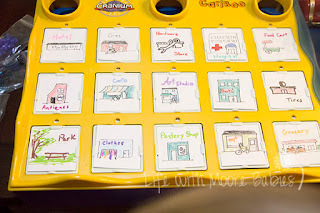 We re-used our Cariboo game again to provide them with options for the answers, but it is not necessary, just worked well for us. Read on to see how we used the game and solved the mystery! Like previous years, we started with balloons, each had a slip of paper in them and a time written on them. 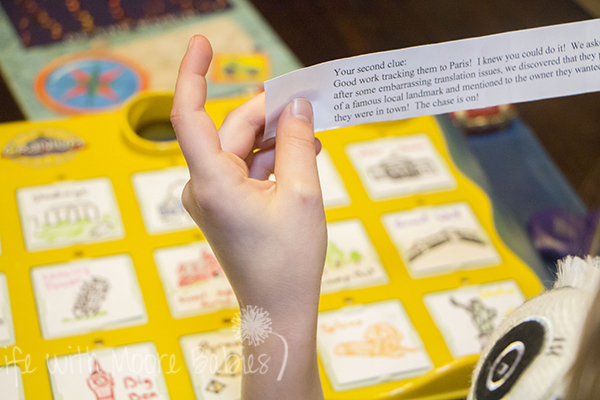 This year, the slips of paper were clues to solve the mystery of who took the gifts we had for the kids. At each hour, they would pop the balloon and get the clue. 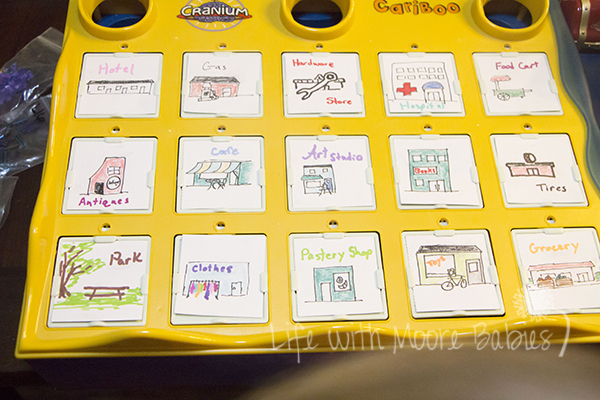 Then they would think through the clue and choose an answer on our Cariboo board (yes, we drew several sets of new pictures for it; one for each clue). If they got the answer right there would be a ball to put in the slot. At midnight if they had solved all the clues they would add the last ball to open the treasure chest to reveal who the culprit was. 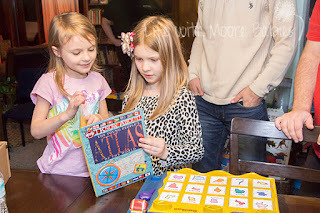 My kids had been playing Carmen Sandiego on the computer, so that is roughly how our clues were formed. 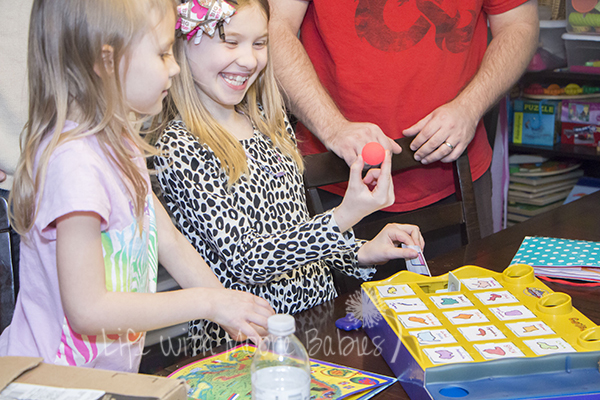 As homeschoolers, we used the clues to review things the kids already knew as well as help them use critical thinking to deduce the answers. For example, here is one of the clues my husband came up with (this was the second clue if that matters), "Good work tracking them to Paris! I knew you could do it! We asked the locals, and after some embarrassing translation issues, we discovered they purchased a postcard of a famous local landmark and mentioned to the owner they wanted to visit there while they were in town. The chase is on!" The answer to that particular clue was the Eiffel Tower, so all the options on our Cariboo game board were famous landmarks the kids had heard of, and they were supposed to remember which was in Paris. So here is what the mystery countdown looked like in action! 1. Pop the balloon. Lots of options here, our kids and their friends opted for scissors. 2. Read the clue. Obviously, this is best for kids that read, but I suppose you could draw pictures or read it out loud for littler kids. 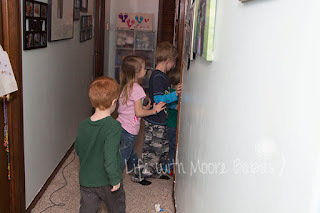 We had a couple 4-year-olds playing, and they just listened to the older kids. 3. Solve the problem given or find the answer to the question. Some of our clues involved math, others geography, and still others they had to use critical thinking to figure out. Like saying the thief was seen eating, and they needed to choose a place on the board that would logically fit the clue (a restaurant). 4. Once you think you know the answer, open the box, and hopefully find a ball! This just added a little extra fun for the kids; plus it allowed us to give them clues that they could deduce by looking at the options. 5. Repeat hourly, until you have solved all the clues! 6. Catch the culprit and make him give you your gifts! 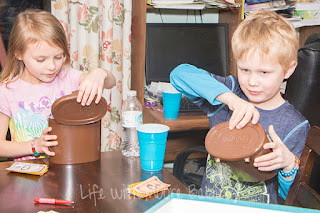 When they opened the treasure box they found a warrant (well a pretend one) for the person responsible for stealing their gifts; good thing the adults here were good sports. After some questioning, they went searching and quickly recovered the missing gifts. 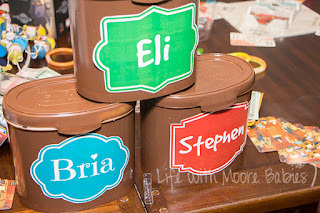 To make the boxes for their gifts, which were hiding in the bathtub, I spray painted old formula containers and stuck labels with each kids name on them. They loved solving the mystery, arresting the guilty party, and opening the surprises we got them! In fact, mine have asked repeatedly if we could do the same things this upcoming New Year's Eve! In fact, they have loved New Year's Eve ever since starting the balloon countdowns. 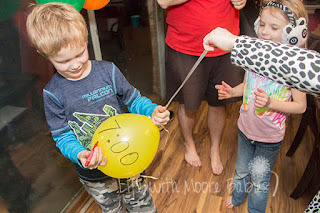 It gives them fun activities to do that keep them occupied during the later hours while keeping me awake with the anticipation of watching them pop the next balloon!